We're closing out the year on a high note in many ways. I'm working on a review of my forecasts from a year ago, and thinking about what the future has in store for us. 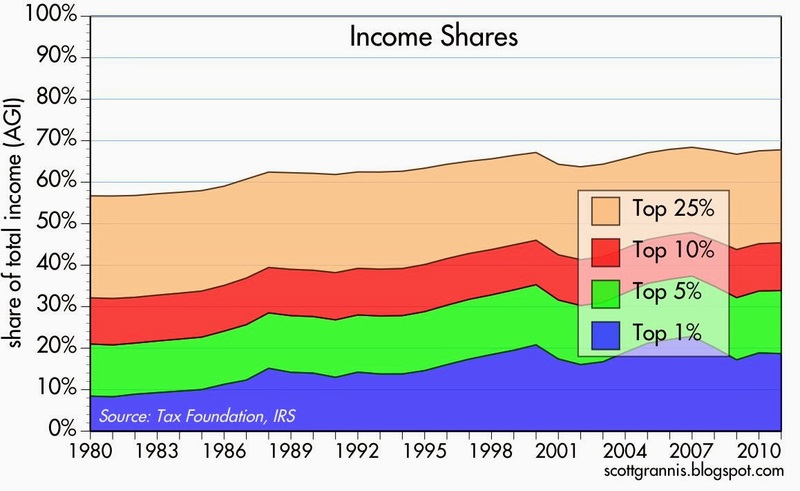 In the meantime, here is random collection of charts that I find very interesting, most of which also point to more good news ahead. 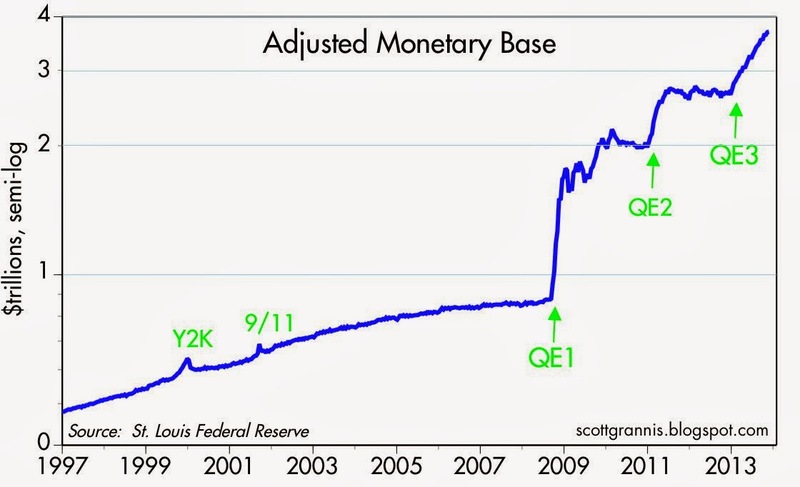 The stated purpose of the Fed's Quantitative Easing bond purchases was to artificially lower bond yields and thus to stimulate the economy. But despite three rounds of QE totaling some $2.8 trillion and a round of Operation Twist (which was designed expressly to pull long-term yields down relative to short rates), the exact opposite occurred: yields are higher and the yield curve is steeper. 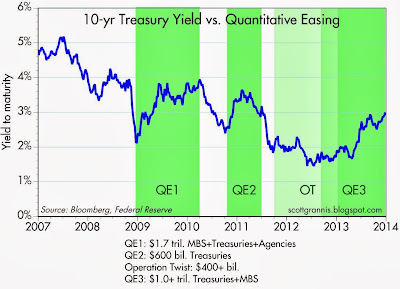 As the chart above shows, Treasury yields rose during each QE episode, and didn't change at all as a result of Operation Twist. 10-yr yields are almost 100 bps higher today than they were when the first QE was announced. It's paradoxical, but in a way the "failure" of QE to produce the desired results is proof that it worked, as I explain here. In any event, this whole episode has taught us that the Fed can't manipulate rates, no matter how much they insist they can. 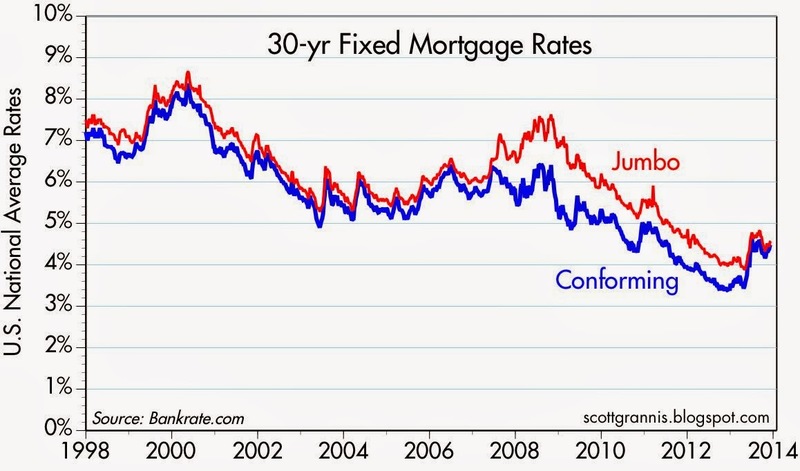 Interest rates are determined by the market, and they are up because the economy has been doing better than expected. It's also interesting that the stock market always worries about higher interest rates—since by the Fed's logic lower interest rates are good for the economy—but in reality higher interest rates can be a very good thing. 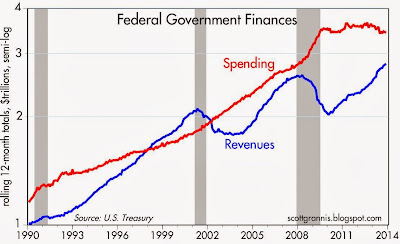 The tapering and eventual reversal of QE will also be a good thing, since it will remove a tremendous amount of monetary uncertainty that exists because of the almost $2 trillion of excess reserves that are sitting on the Fed's balance sheet today. Gold was on a tear from the beginning of 2001 until a year ago—a fantastic winning streak that fed on investors' fears of a terrible economy and massive monetary expansion. 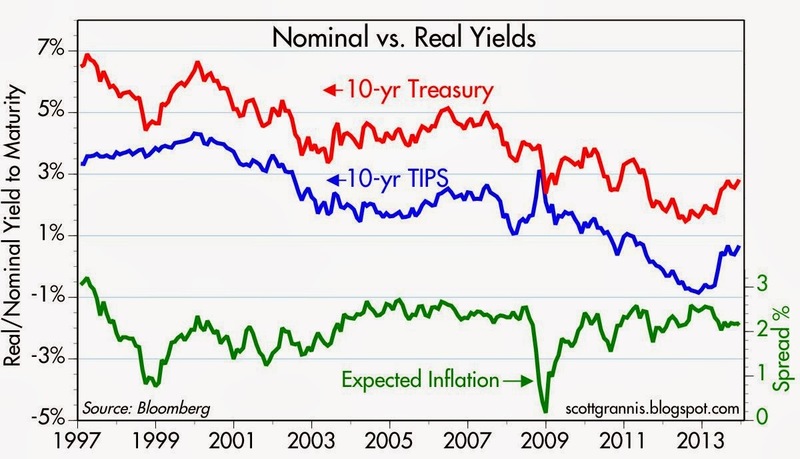 In roughly the same time frame, real yields on 10-yr TIPS fell from 4% in 2000 to an almost unbelievable low of -1.8% earlier this year for similar reasons. Both have since reversed dramatically, as shown in the chart above, in a sign that the fear and risk aversion that have characterized this recovery are beginning to fade. 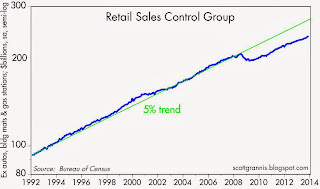 If these trends continue, it will be because confidence is returning, and that bodes very well for the long-term economic outlook. 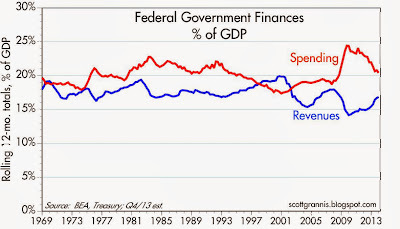 Although it may also make the Fed's job of reversing QE more difficult, since as confidence returns the demand to hold cash and excess reserves will fall, and this could result in an unwanted expansion of the money supply and higher inflation. 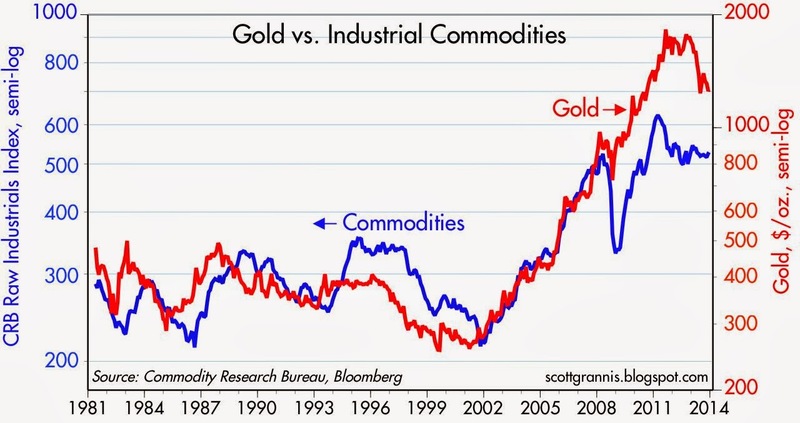 Gold and commodity prices tend to track each other over time, but they diverged significantly beginning in late 2008. In the past year they have been coming back into alignment. 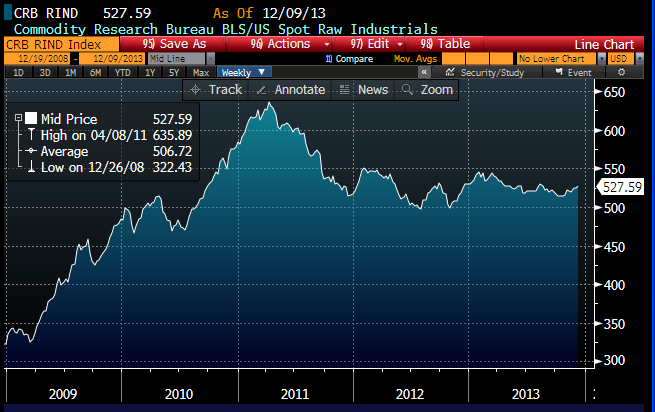 Commodities are roughly unchanged for the past several years, but gold has been pounded. The age of speculation has ended. We hope it will be replaced by a new era of investment-led expansion in the coming years. The yen has weakened considerably against the dollar over the past year, and Japanese stocks have skyrocketed, as shown in the first of the above charts. As the bottom chart shows, Japan may finally have broken the deflationary spell that had plagued the economy for the past several decades—most of which was due to an excessive appreciation of the yen. Easier money and a somewhat more stimulative fiscal policy augur well for the Japanese economy. Corporate profits after tax have reached an unprecedented high of 10% of GDP, yet equity prices have not yet eclipsed their 2000 highs in real terms. 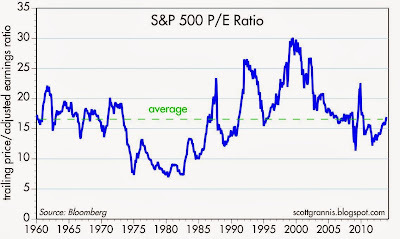 However you look at equity valuation, I think it is hard to build a case for equities being overvalued today. Multiple expansion is likely to be the principal driver of higher equity prices in the year to come, but that's not yet something to worry about. 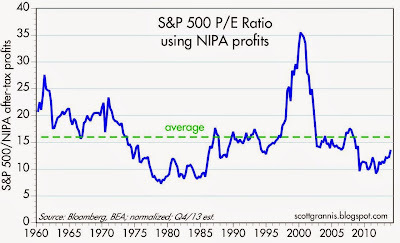 As the chart above shows, equity multiples using the NIPA measure of after-tax corporate profits are still below average. Concerns about the risk of a "Japan-style deflation" in the U.S. are once again heating up, as the Fed prepares to taper its bond purchases, something that's very likely to happen either this month or next. The worry—echoed in a front-page article in today's WSJ—is that tapering and eventually ending QE at a time when inflation is unusually low runs the risk of producing even lower or negative inflation (i.e., deflation), which in turn could doom the U.S. economy to very weak or even negative growth for the foreseeable future, much like the problems that have plagued the Japanese economy for many years. 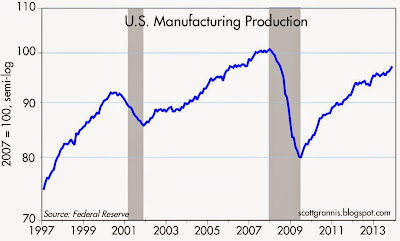 Without ongoing QE support, the thinking goes, the U.S. economy could fall into a sort of deflationary quicksand and/or lose all forward momentum. 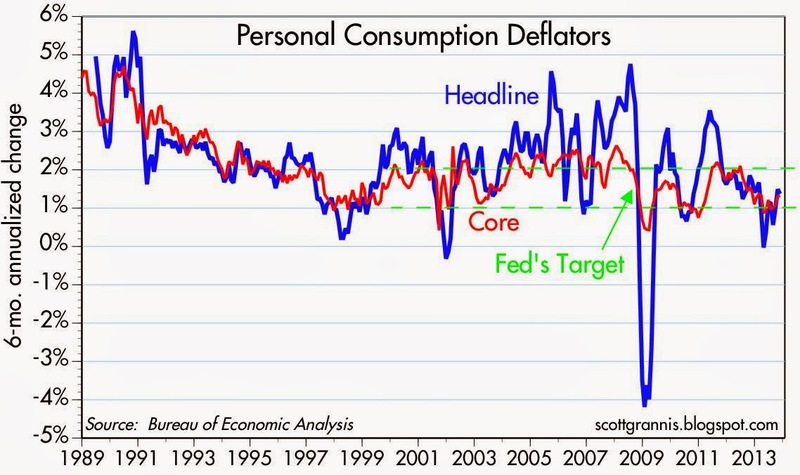 But is deflation really so dangerous, and has growth really been so dependent on QE? I think these concerns are not only exaggerated but in fact groundless. 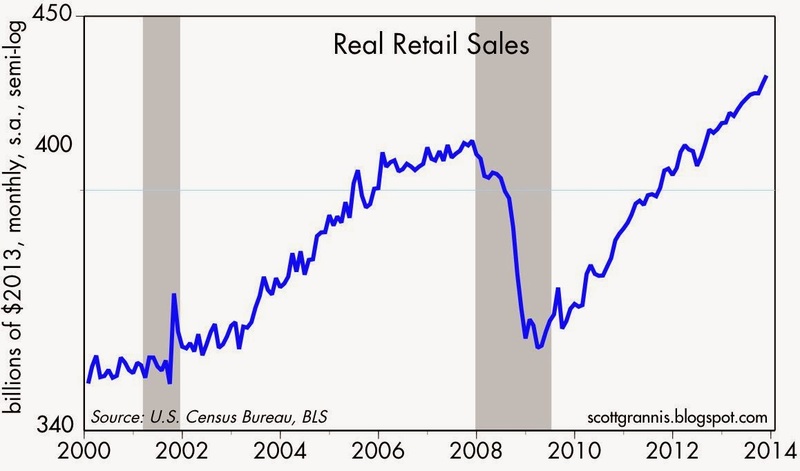 For one, the U.S. is not even flirting with deflation. 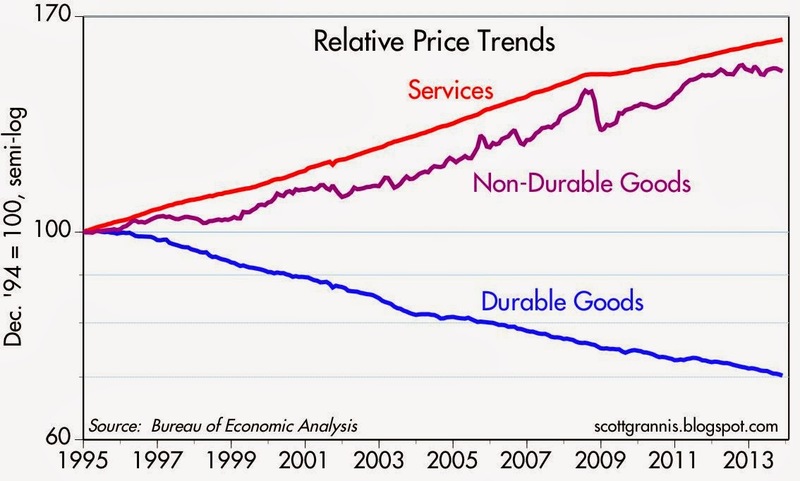 Second, deflation is not necessarily a bad thing and it does not necessarily lead to weaker growth. Japan's demographics have likely contributed more to its relatively sluggish growth than deflation has. 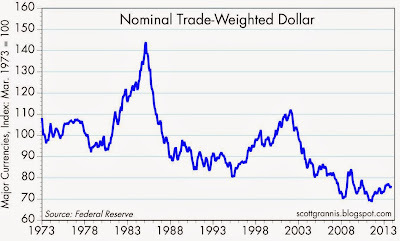 Third, there is an important difference between the U.S. today and Japan of the past several decades that makes pervasive and crippling deflation in the U.S. economy very unlikely: the dollar has been and continues to be very weak, whereas the Japanese yen was extremely strong for decades. Finally, and as I've argued repeatedly in this blog, I don't think that QE policy was ever designed to be stimulative, and that's why it hasn't contributed to boost growth or raise inflation. Contrary to what central bankers all profess and the WSJ article repeats, namely that central bankers have been engaged in "unprecedented money-printing campaigns," there is no evidence of any unusual growth in the money supply. 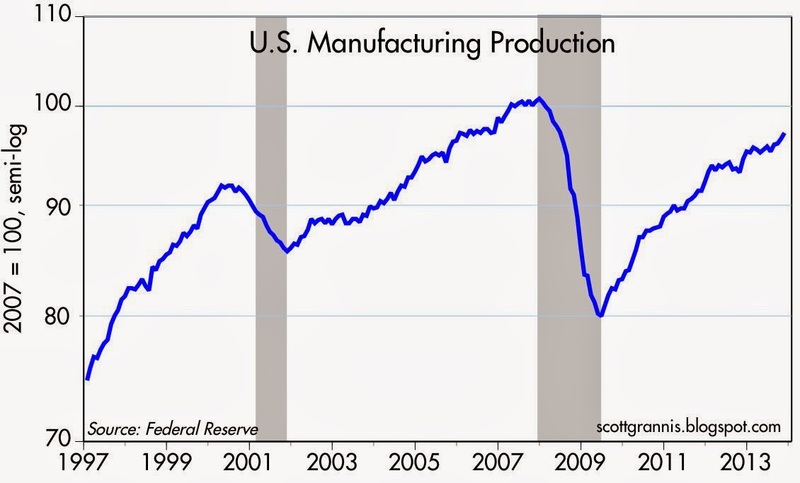 Put simply, the Fed has not been printing money with abandon. The Fed has simply been exchanging bank reserves, which are now close substitutes for T-bills, for notes and bonds. The beginning of tapering and the eventual end of QE is therefore not going to be contractionary or deflationary. 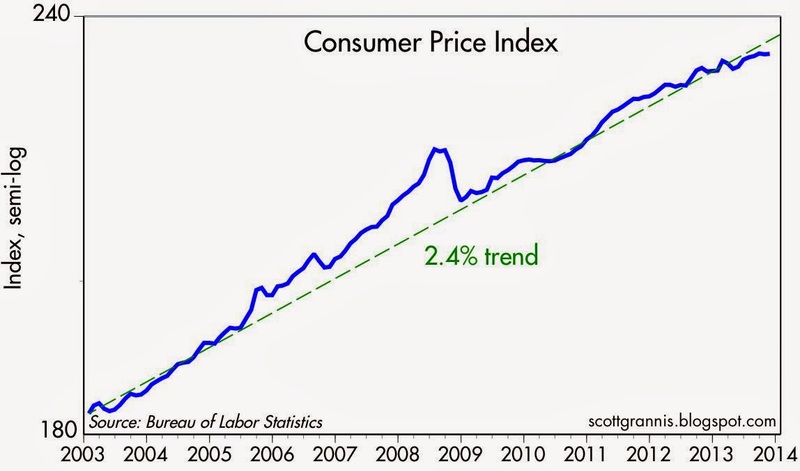 Let's begin by taking a look at inflation in the U.S. as measured by the Consumer Price Index. The U.S. consumer price index registered a zero rate of inflation in November, but it is up 1.2% over the past year, and it has risen at an annualized rate of just under 2.4% for the past 10 years. 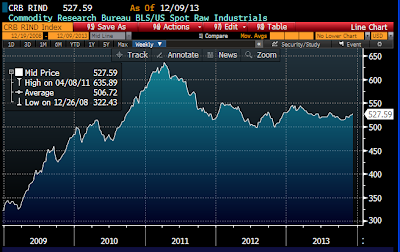 As the first of the charts above shows, the CPI index today is only slightly below its 10-yr average growth rate. What we've seen in the past year is a modest slowing in the rate of inflation, but this is hardly a sign of impending deflation. As the second of the above charts shows, the weakness in the headline CPI owes a lot to falling energy prices: ex-energy, the CPI is up 1.6% in the past year. 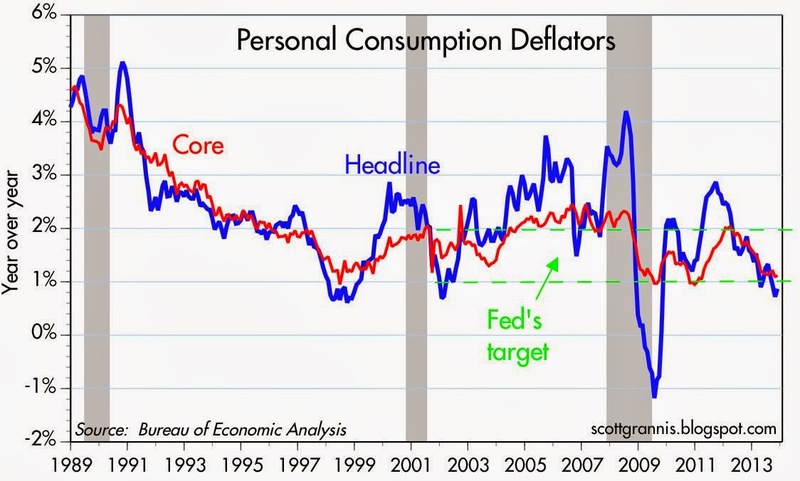 Plus, as the third of the above charts shows, over the past six months both core and headline CPI inflation have been running at very close to a 2% annualized rate. Bottom line: Inflation is relatively low, but it is not even remotely zero or negative. 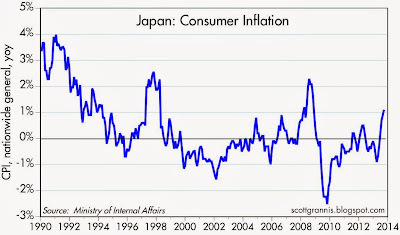 It's a little-known fact, but if you're looking for evidence of deflation in Japan, you won't find it in their Consumer Price Index. At the consumer level, inflation in Japan has been essentially zero for the past 20 years (see chart above). The index has bounced around a bit along the way, but has trended neither higher nor lower since 1993. 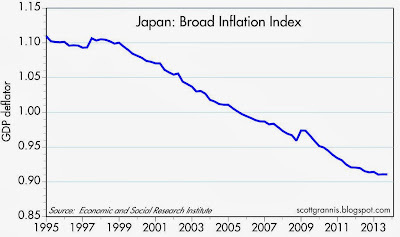 Deflation only shows up in Japan's Producer Price Index and in the GDP deflator, the latter of which is shown in the chart above, and it didn't start until 1999. Since the end of 1998, the Japanese economy has experienced a 1.25% annualized rate of deflation: on average, prices across the entire economy have fallen by roughly 17% over the past 15 years. Deflation now appears to be ending, however, with consumer prices up 1.1% in the year ending October, and the GDP deflator down only 0.3% in the year ending September, thanks to a concerted easing effort on the part of the Bank of Japan which has resulted in a significant decline in the value of the yen. 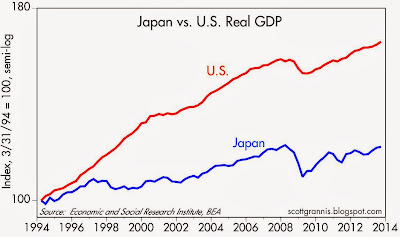 As the chart above shows, since the onset of deflation in 1999, Japan's economy has grown at a paltry 0.8% annualized rate, far less than the 2.1% annualized growth of the U.S. economy over the same period. It's tempting to lay the blame for Japan's sluggish growth on the doorstep of deflation, but that overlooks the role of demographics. Thanks to its rapidly aging population and low fertility rate, the Japanese workforce (the number of people working) has shrunk by almost 4% since its 1997 peak, even as the unemployment rate declined to only 4%. 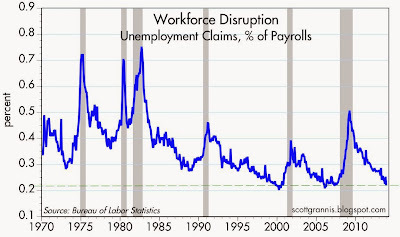 Contrast that to the almost 11% increase in the U.S. workforce over the same period (which has actually been much slower than is typical), and you see that the U.S. has had the benefit of a 0.9% annualized increase, relative to Japan, in the number of people working. 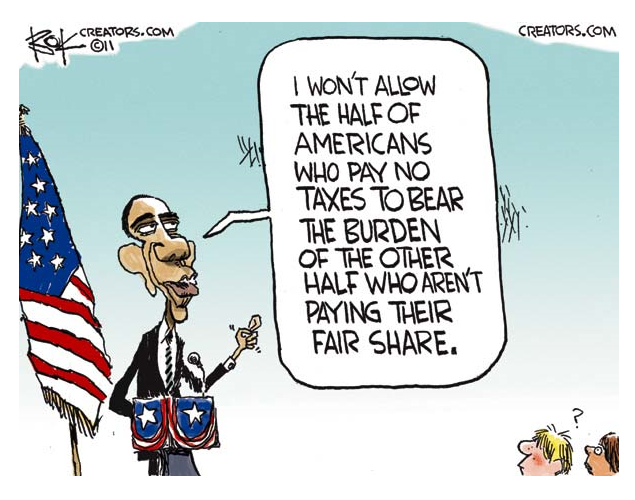 That could explain as much as 70% of Japan's growth shortfall relative to the U.S. 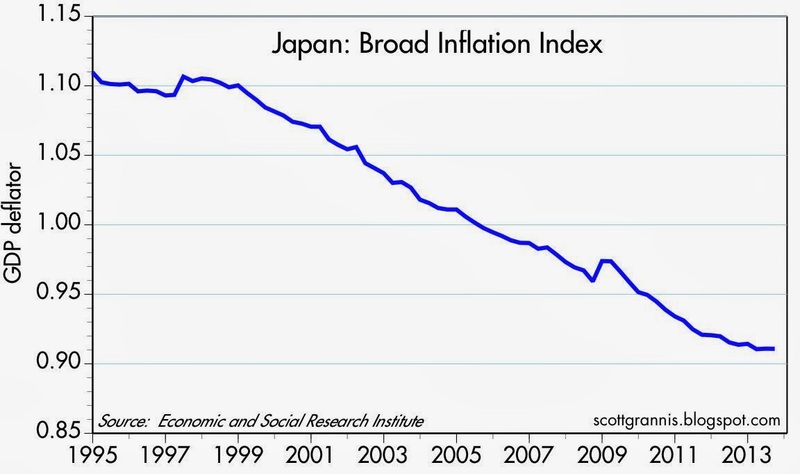 Deflation, in other words, is likely only a small part of Japan's slow-growth story. 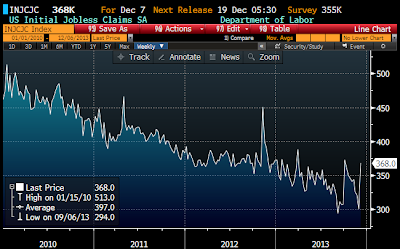 When the number of people of working age declines, it's hard for an economy to grow. Japan's total population, by the way, is already declining, and is expected to fall by 3% within the next 5 years relative to its high, which was 5 years ago. The U.S. population is expected to grow by 6.5% over the next 5 years, so the disparity between Japanese and U.S. growth could become even more pronounced. The talk about Japan's deflation and slow growth has been with us for years (I had a post on this same subject back in May '11) so it's easy to be lulled into thinking that deflation necessarily results in slow growth. The popular argument goes like this: when consumers realize that their money buys more every year, they are less likely to spend, since saving—even with very low interest rates—becomes an attractive way to make money. For their part, borrowers soon learn that when prices fall it becomes harder to generate the cash needed to service debt. 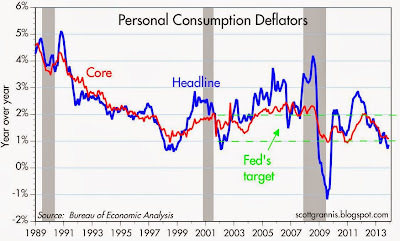 Deflation thus acts to depress borrowing and spending, and a shortfall of demand is what causes growth to be weak. In reality, it's not as simple as that. 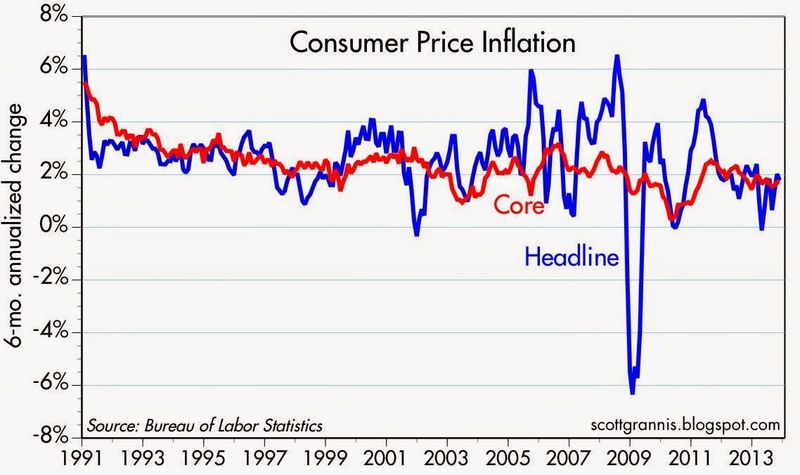 Deflation is not necessarily worse than inflation. What hurts an economy is when inflation turns out to be very different from what people expected. Persistently high inflation (such as that suffered by Argentina in the 1970s and 1980s) can wreak havoc in an economy, but it doesn't rule out growth. Lots of inflation is bad because creates uncertainty and high interest rates, which in turn make it difficult to make long-range plans. 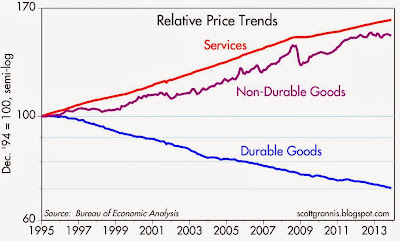 On a more mundane level, while deflation may cause some consumers to cut back on their purchases in order to acquire more goods and services in the future, other consumers discover that deflation has increased their purchasing power and their standard of living. Borrowers don't necessarily suffer from deflation either; when inflation becomes very low or negative, interest rates invariably fall to very low levels as well. Real interest rates—the true measure of the burden of debt—are actually about the same in Japan as they are in the U.S. Using GDP deflators, for example, the real yield on 10-yr JGBs today is about 1.1%, while the real yield on 10-yr Treasuries is about 1.3%. 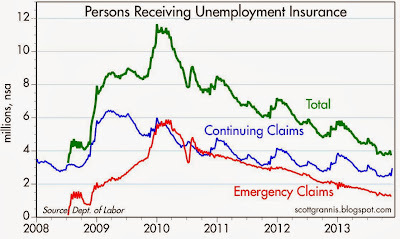 One last observation: As a rule of thumb, inflation benefits borrowers, while deflation benefits savers. Arguably, it's better to have motivated savers (the source of the capital needed to fuel productivity-enhancing investment) than motivated borrowers (especially the type that just want to speculate on higher prices). 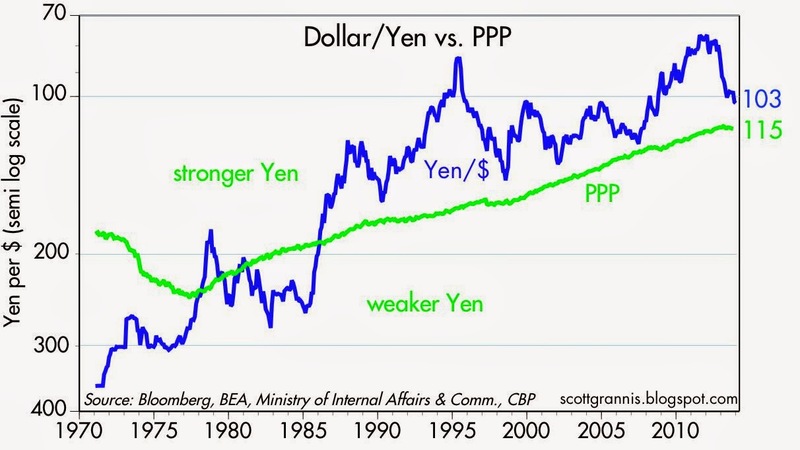 Let's now take a look at what is most likely the proximate cause of Japan's long bout of deflation: the significant and long-lasting appreciation of the yen. 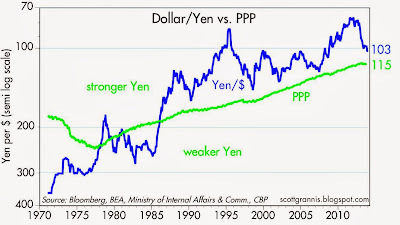 Beginning in the 1970s, the Bank of Japan adopted such an austere approach to monetary policy (restricting the growth of the money supply) that the yen appreciated against other major currencies for the next 35-40 years. Demand for yen simply outstripped supply. A chronic and relative shortage of yen drove its value up from from 350 to the dollar to as strong as 76 to the dollar in late 2011, and from 250 to the euro (using the DM as a proxy) to less than 100. That's appreciation by a factor of 4.6 times against the dollar, and 2.5 times against the euro. The steady appreciation of the yen forced Japanese exporters to cut their prices in order to remain competitive, and it forced domestic-oriented companies to cut their prices as well, in order to compete with an ever-cheaper flood of imports. 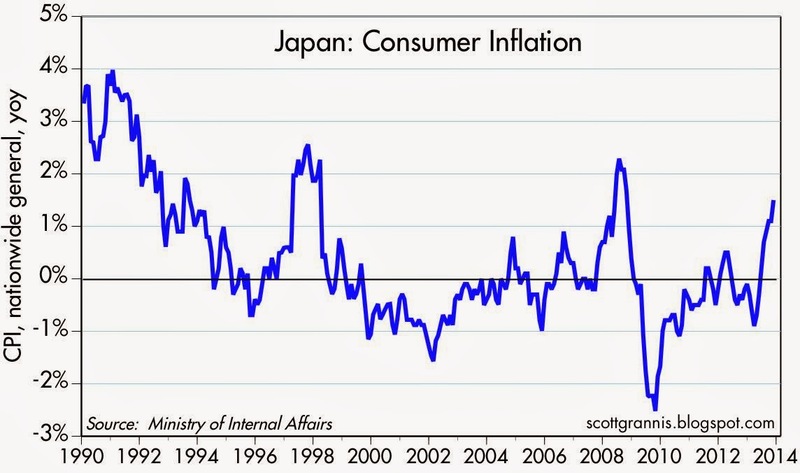 As a result, Japanese inflation was significantly lower than that of most other major economies for over 35 years. 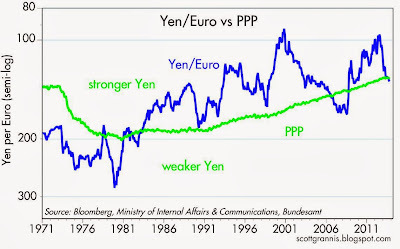 This fact is reflected in the upward slope of the green line, which is my estimate of the Purchasing Power Parity of the yen. The slope is upward because the Japanese price level rose by much less—and more recently fell—compared to the price level of other industrialized economies. While the yen was surging against the dollar and the euro, the dollar was falling against almost all major currencies, as shown in the chart above. U.S. exporters have not faced the downward pricing pressures that Japanese companies have had to deal with for decades. Even after adjusting for relative inflation differentials, the real value of the dollar today is very close to its weakest ever, as shown in the chart above. U.S. companies have not been forced to continuously cut costs and prices like their counterparts in Japan. This is a "night and day" difference which could explain at least part of the reason that Japan's economy has been relatively weak. From a fundamental point of view, the U.S. economy has not been subject to the relentless deflationary pressures from abroad that have plagued Japan. On the contrary, inflation and a weak currency have been the norm for the U.S. ever since the early 1970s, whereas it has been just the opposite for Japan. 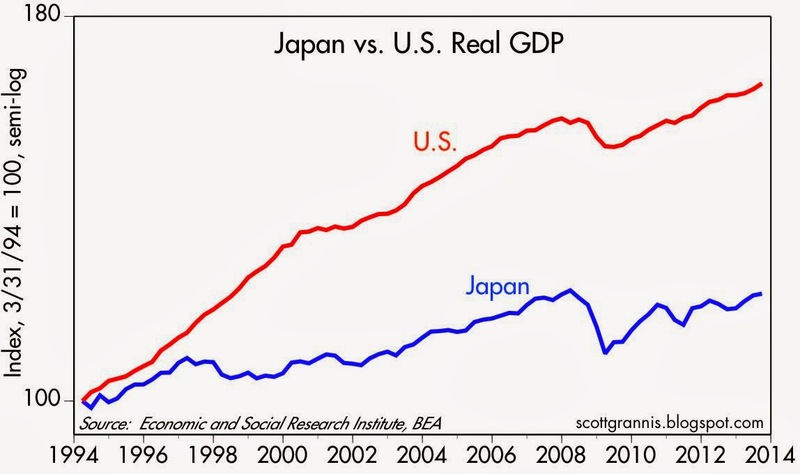 I think all of this adds up to a powerful argument for why there are no useful parallels between the U.S. and Japan when it comes to the risk of deflation and slow growth. Looking ahead, there is one thing that has really changed on the margin, and that is the yen's significant decline over the past year. 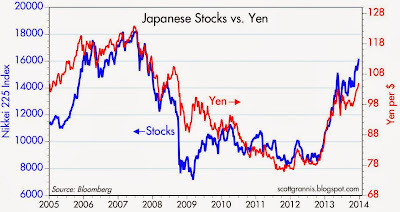 As the chart above shows, the decline of the yen has corresponded tightly with the rise of the Japanese stock market. This provides confirmation for my thesis here, which is that the appreciation of the yen beginning in the late 1990s was symptomatic of overly-tight Japanese monetary policy which proved to be a burden on the Japanese economy. Now that Japan has apparently succeeded in fundamentally relaxing its monetary policy, the prospects for the Japanese economy have brightened. 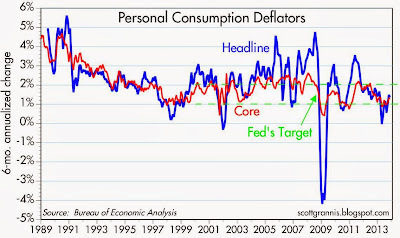 Why then has U.S. inflation remained low and slowed of late if the Fed is doing all it can to keep interest rates low? I fleshed out the answer to this question in a post earlier this month: it's because we have been experiencing the most risk-averse recovery ever. Risk aversion and a general lack of confidence have translated into very strong demand for money and bank reserves. This is not likely to get worse, and the decline in gold prices and the rise in real interest rates suggests that confidence is slowly returning and risk aversion is beginning to decline. A gradual decline in risk-aversion and a gradual increase in confidence cry out for the tapering and eventual reversal of QE. In the meantime, there is no evidence to suggest that the Fed has burdened the U.S. economy with overly-tight monetary policy, because the dollar has been and continues to be weak. 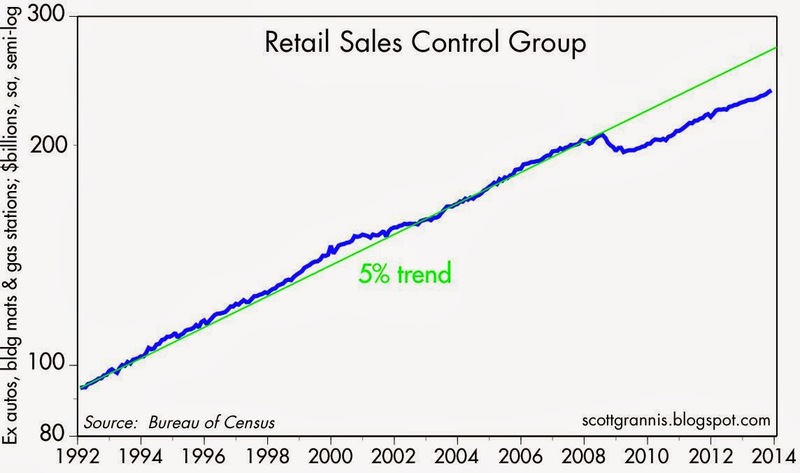 The U.S. economy is not condemned to nor at great risk of a future of deflation and slow growth. November industrial production rose much more than expected (+1.1% vs. +0.6%), led by a 0.6% increase in manufacturing production, which is up at a 5.1% annualized rate in the past 3 months. 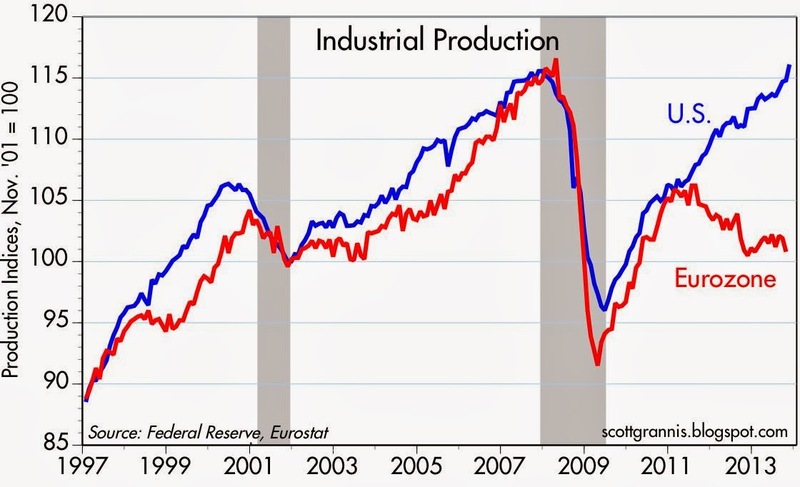 Industrial production has now reached a new all-time high. 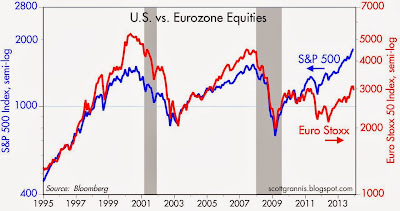 The contrast between the vitality of the U.S. economy and the ongoing struggles of the Eurozone economy (see top chart above) is stark, and can also be seen in the significant outperformance of the U.S. equity market (see chart below). If we were doing as poorly as the Europeans, then we would really have something to complain about. 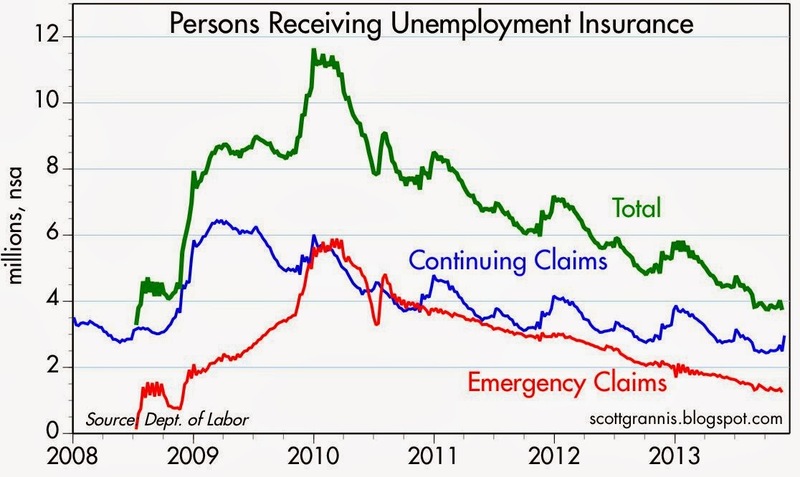 As it is, all the evidence points to a substantial and ongoing recovery in the U.S. Things could be a lot better, to be sure, but the pervasive negative sentiment regarding the health of the U.S. economy is way overdone, in my view. 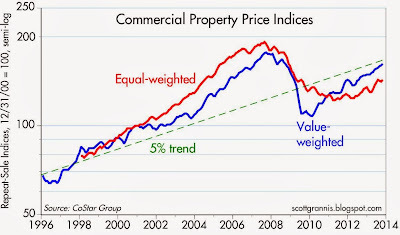 Five years ago global financial markets were in a shambles, global trade was shutting down, credit spreads had blown out to unbelievable levels, and most people's hopes for the future were going up in smoke as their homes and their investments collapsed in price. Since then we've pulled back from the abyss, financial markets are as calm as they've ever been, the economy is growing, and equity markets are booming. In many important ways, the recovery and the improvements we've seen in recent years have far surpassed even the super-optimists' wildest dreams. 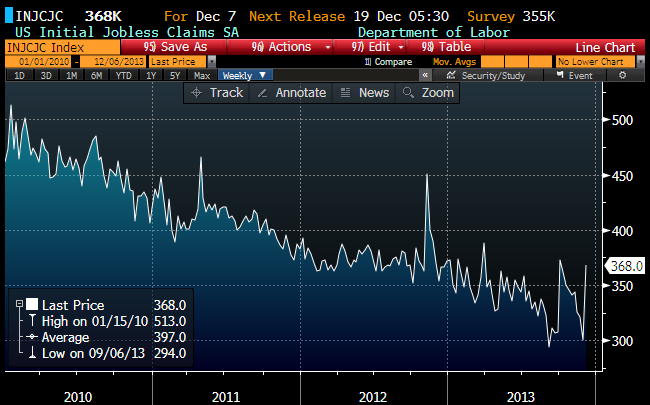 Nobody saw this coming, and it's all very good news, even though this is the weakest recovery ever. 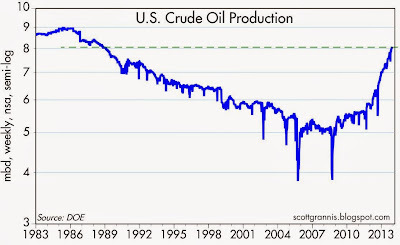 Back in July 2008, U.S. crude oil production was just over 5 million barrels per day. 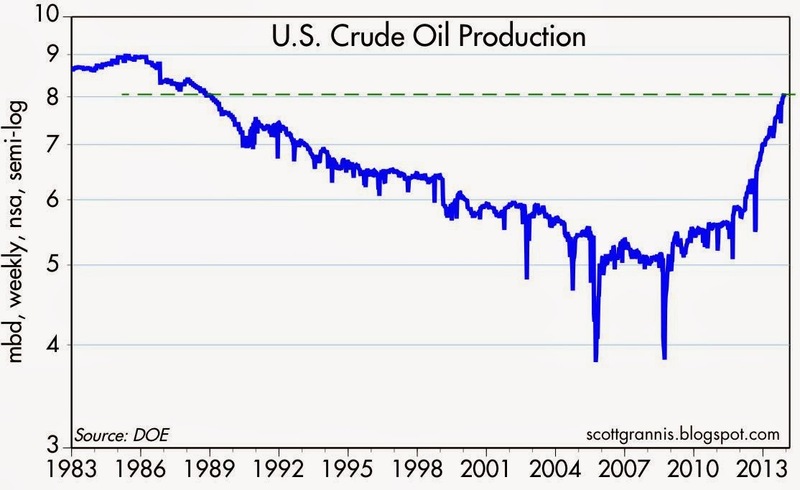 At that time, NOBODY would have predicted, even in their wildest dreams, that crude production would increase by 60% (to 8 mbd) by the end of 2013. But it happened, thanks to fracking technology. 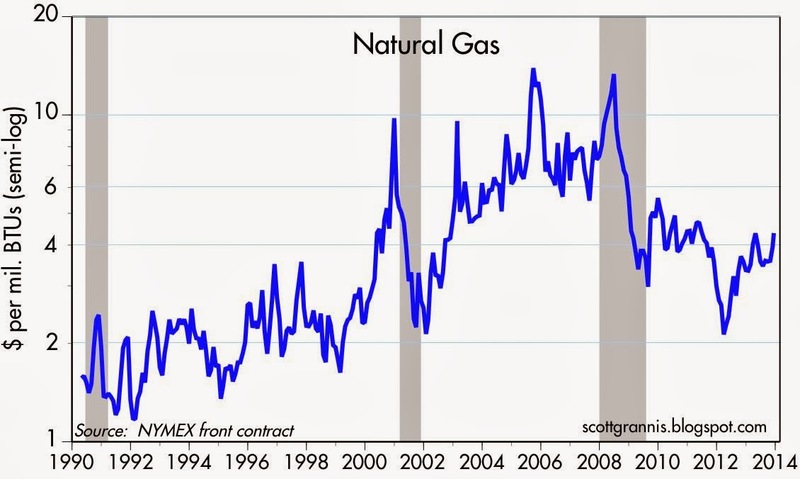 Back in July 2008, natural gas prices hit an astounding high of $13.58 per million BTUs. 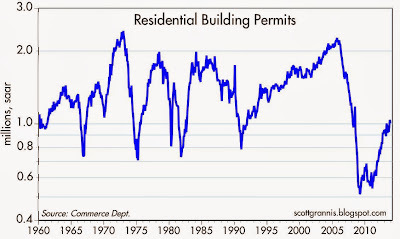 At the time, the talk was of critical and chronic shortages that would push prices still higher and potentially cripple the economy. 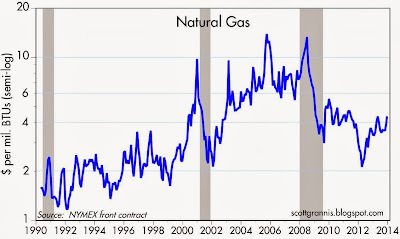 NOBODY would have predicted, even in their wildest dreams, that natural gas prices would fall by two thirds by the end of 2013, blessing U.S. consumers with some of the lowest energy prices in the world. But it happened, thanks to fracking technology. 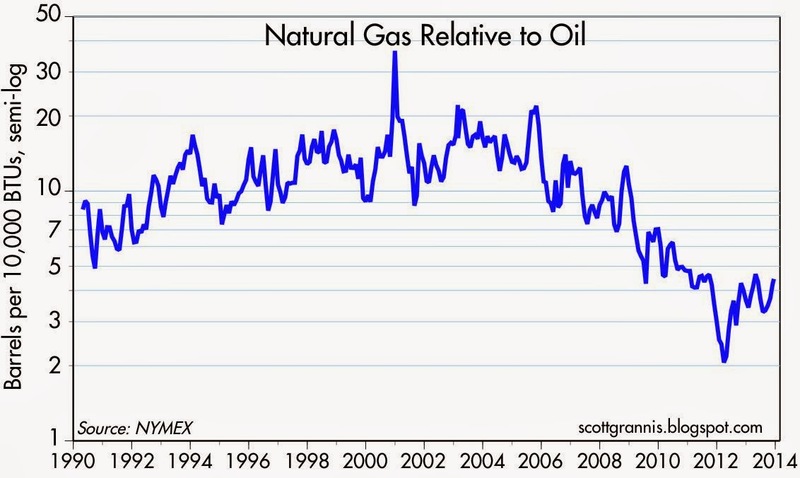 Back in the first half of 2003, natural gas prices on average reached their highest level ever relative to crude oil on a sustained basis. 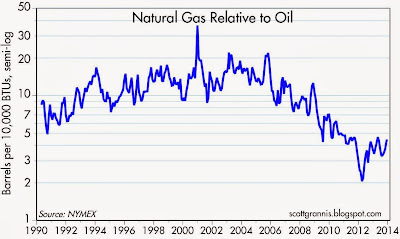 NOBODY would have predicted, even in their wildest dreams, that natural gas prices would fall by 75% relative to crude oil prices over the next 10 years, thus conferring a unique advantage to U.S. industrial energy consumers, due to the difficulty of exporting the growing relative abundance of U.S. natural gas supplies. But it happened, thanks to fracking technology. 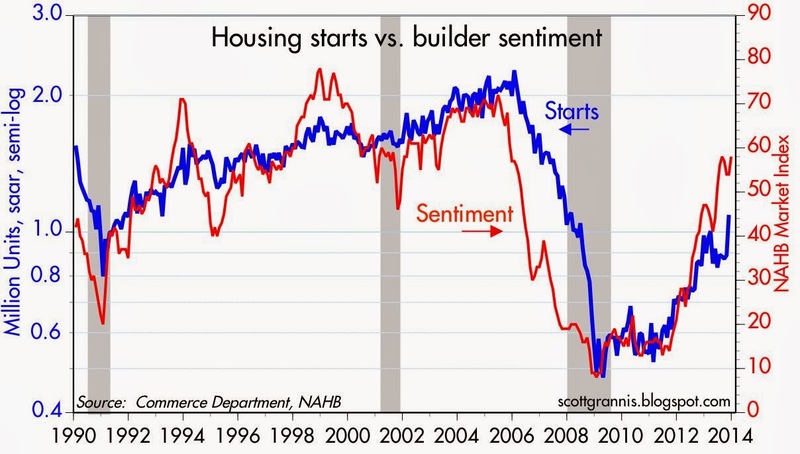 As Mark Perry notes, "The Great American Energy Boom ... might qualify as the most important economic story of the past decade." 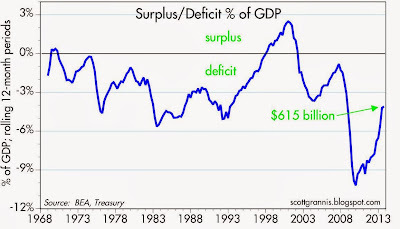 Back in December 2009, the federal deficit was 10.2% of GDP, and we were told that deficits exceeding 9% of GDP were economically debilitating and could spiral out of control. 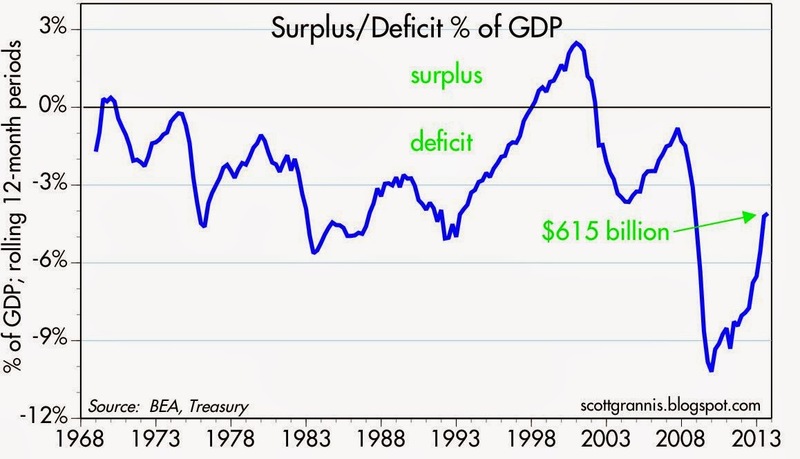 At the time, NOBODY would have predicted, even in their wildest dreams, that the deficit would decline to a mere 3.6% of GDP within the next 4 years, thus eliminating the need for higher tax rates. 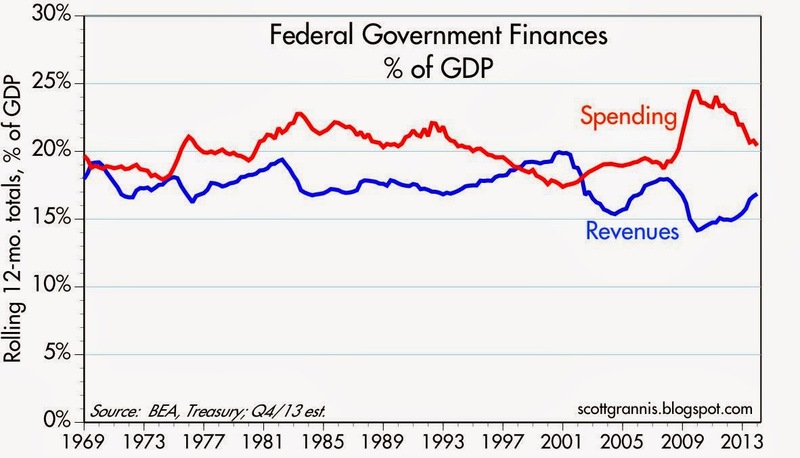 But it happened, thanks mostly to zero growth in federal government spending and a growing economy. Back in mid-September 2008, the monetary base totaled $875 billion, and it had grown only 5% per year over the previous decade, and only 2.3% over the previous year. 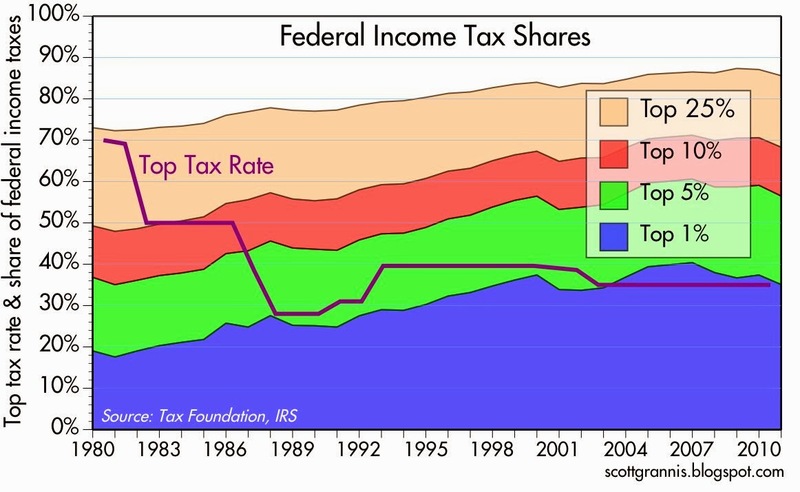 At the time, NOBODY would have predicted, even in their wildest dreams, that the base would more than quadruple over the next five years. 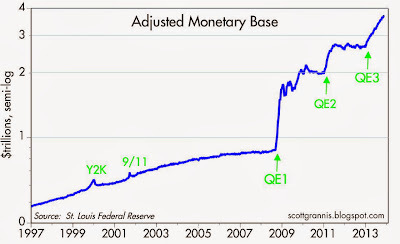 And even if you had God's word that you spoke the truth, every living economist at the time would have told you that such an explosive increase in the monetary base would almost certainly lead to an explosion of inflation. 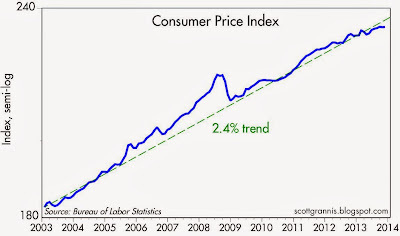 NOBODY would have predicted that an explosion of the monetary base would have resulted in a rate of consumer price inflation that would average only 1.5% per year over the next 5 years. But it happened, thanks to the fact that the Fed decided to pay Interest on Reserves, and thanks to banks' almost insatiable demand for safe, risk-free assets. 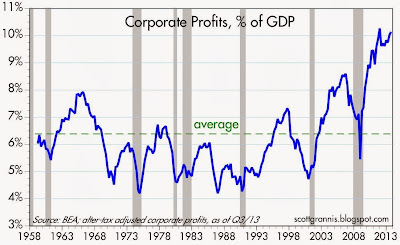 In late 2008, when we learned that after-tax corporate profits for the third quarter had fallen to 7.1% of GDP, down from an all-time high of 8.6% just two years earlier; when the stock market had lost almost half its value in less than a year; and most chartists were predicting that profits would mean-revert to 6% or less of GDP, NOBODY would have predicted, even in their wildest dreams, that corporate profits would hit an unimaginably high 10% of GDP within the short span of only three years. But it happened, thanks to the Fed's QE efforts, corporations' inherent dynamism and the ability of the U.S. economy in general to cope with adversity, among other things. 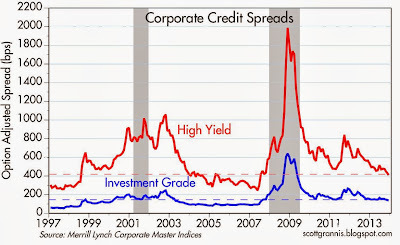 Near the end of 2008, as financial markets were imploding and corporate credit spreads had reached previously unimaginable heights—which in effect predicted that 24% of all corporate bonds would be in default within the next 5 years, and the next several years would be the most disastrous in the history of the U.S.—almost nobody would have predicted that it was the buying opportunity of a lifetime. But it was, even though markets didn't hit bottom until a few months later. Markets move and economies respond when the future turns out to be different than what everyone expected it to be. The past five or so years have been a case study in how this can happen, as we have swung from expecting the end-of-the-world-as-we-know-it to now being in the fifth year of a recovery. The future turned out to be MUCH better than expected in many ways—even though this has been the weakest recovery ever—and that is the main reason that the equity and corporate bond markets have enjoyed their most spectacular rally on record. 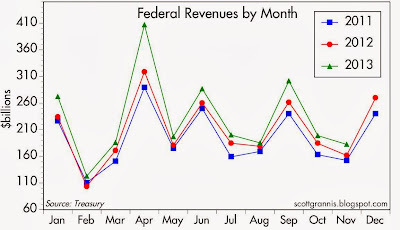 In my view, market-based data are better indicators of what is going on beneath the economy's surface than official statistics. Market-based data are usually available in real-time, and they are derived from the interactions of millions of participants from all over the world—the wisdom of crowds distilled into one number. 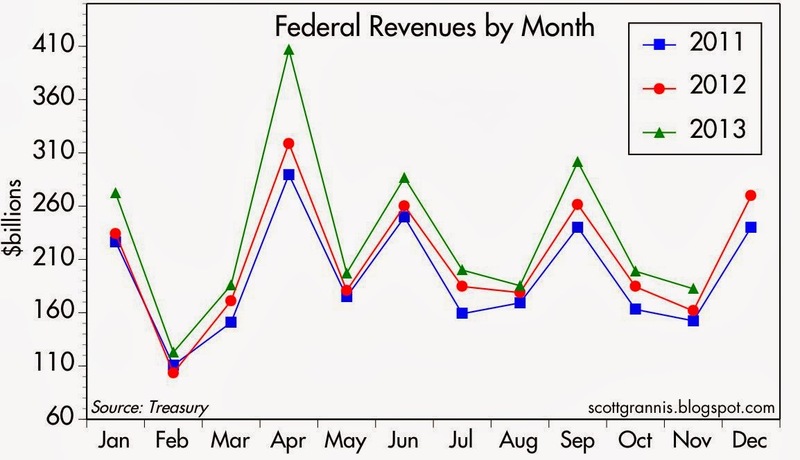 They aren't seasonally adjusted, and they aren't subject to revisions after the fact. But they do require some interpretation, so here is a collection of 10 market-based indicators that I'm paying attention to, and why. On balance, I think they all reveal a gradual improvement in the economic and financial fundamentals, but the persistence of a general aversion to risk. 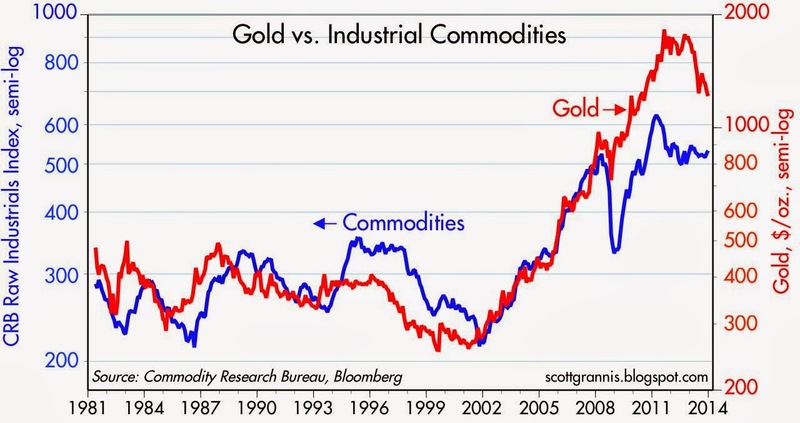 Gold and commodity prices tend to track each other over time, but gold is much more volatile (note that the range of the y-axis on the right is about twice the range of the same y-axis on the left). 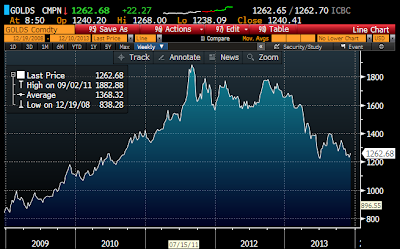 Gold tends to lead other commodity prices, being the most speculative of them all. Gold also is unique among commodities since all the gold ever mined throughout history is still held by someone somewhere, whereas most other commodities are either incorporated into other stuff, consumed, or deteriorate with time. 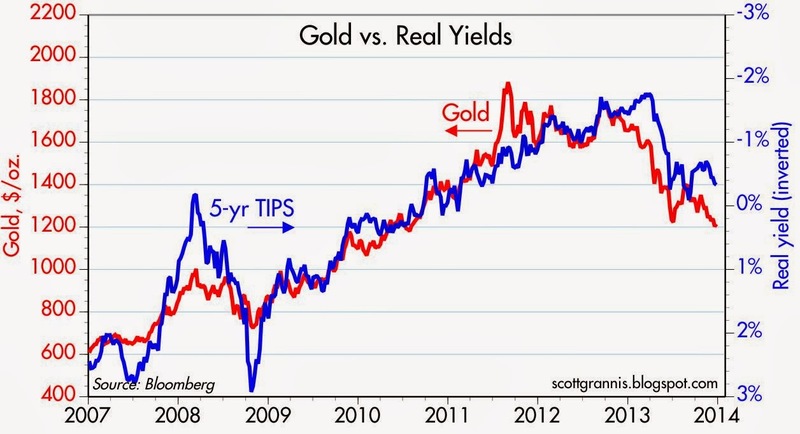 Gold is the classic refuge from inflation, geopolitical risk, and just plain uncertainty. 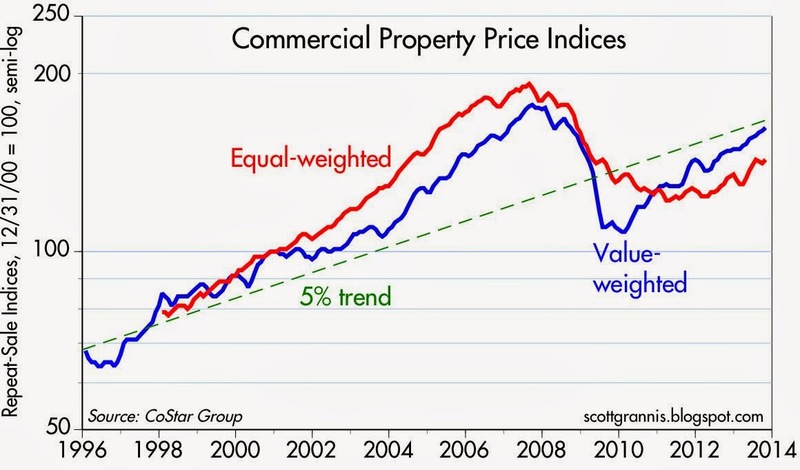 It's a darling of speculators, perhaps because it's price can go up or down enormously and it's widely held. 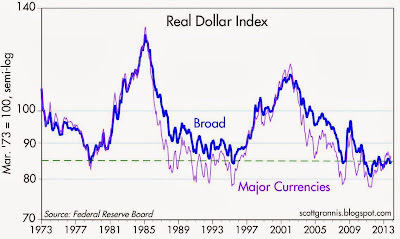 What the chart above tells me is that gold overshot the prices of commodities in the early years of the current recovery—in part due to concerns that the Fed's QE program would lead to hyperinflation—and is now in the process of realigning since inflation remains low and stable. 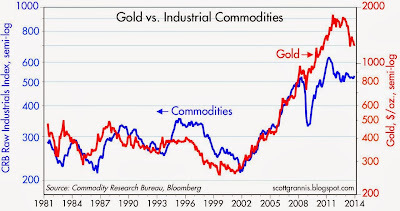 Industrial commodities have been relatively stable for several years now, and gold looks to be in the process of coming back down to a level that is more consistent with the current level of industrial commodity prices. I note that over the past century, the real price of gold in today's dollars has averaged just under $600/oz. The two charts above zoom in on the prices of gold and industrial commodities over the past 5 years. Gold looks like it's having a tough time maintaining its current lofty levels, while industrial commodity prices have been unusually stable for the past two years. Gold prices have tracked the inverse of the real yield on 5-yr TIPS amazingly well over the past seven years. 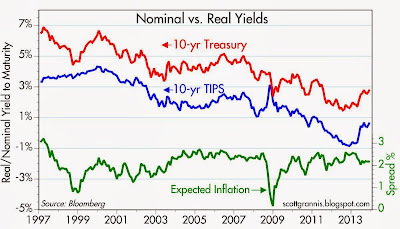 (Think of the inverse of real yields as the price of TIPS.) 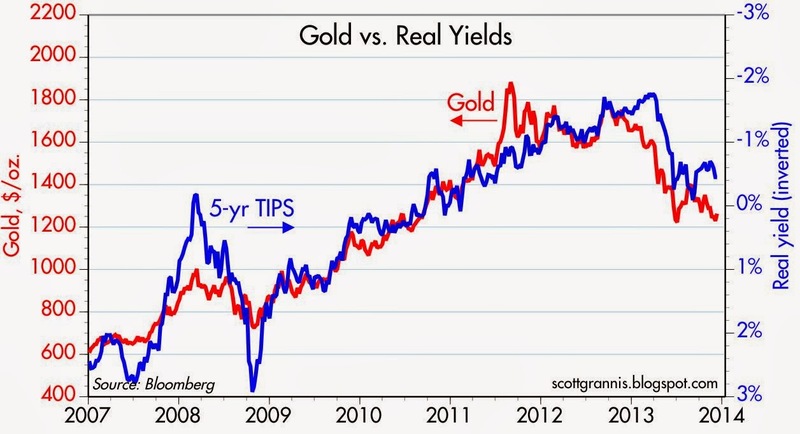 The world was willing to pay ever-higher prices for gold and TIPS through 2012 because—as I see it—the world was desperate for safe assets that also offered protection against inflation. Prices for both were bid up to extremely high levels (corresponding to strongly negative real yields on TIPS) which reflected deep-seated pessimism and very bearish expectations for the future. Instead of doom and gloom, we have since seen inflation remaining low and economic growth fundamentals in the U.S. improve on the margin. 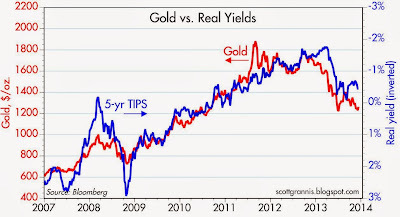 Both TIPS and gold are thus facing selling pressure. Still, at current levels both reflect a fairly strong demand for risk-free assets, and thus reflect a market that is still moderately risk-averse. 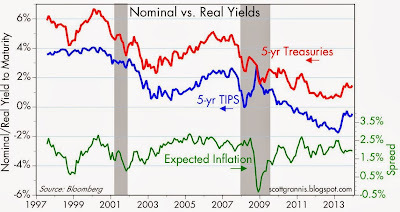 The two charts above track nominal and real yields on Treasuries, and the difference between the two which is the market's expected inflation rate. 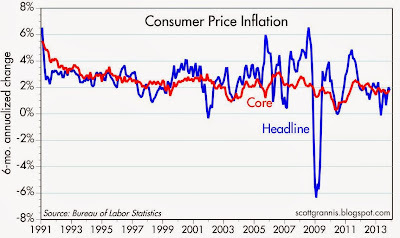 If anything stands out, it is that expected inflation hasn't changed much in the past 16 years. The market currently expects inflation over the next 5 and 10 years to average a little over 2%, and that is very close to what inflation has actually averaged over the past 5 and 10 years. 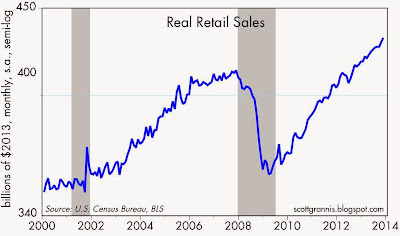 This tells us that the market does not see believe that the Fed's QE policy will be inflationary. 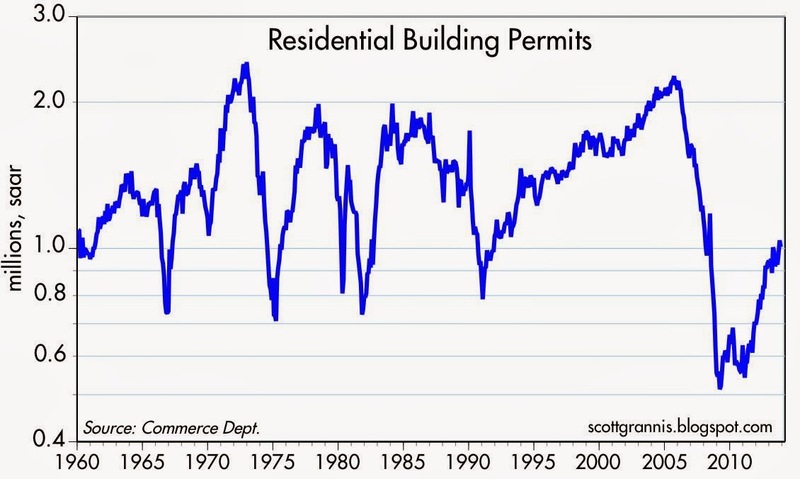 Should that change, and if expected inflation were to begin rising, that would be very significant, since it would presage a significant increase in interest rates and a more rapid than expected shift by the Fed to tighter monetary policy. 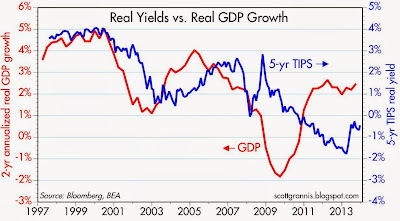 Real yields on TIPS should tend to track real growth expectations for the U.S. economy. 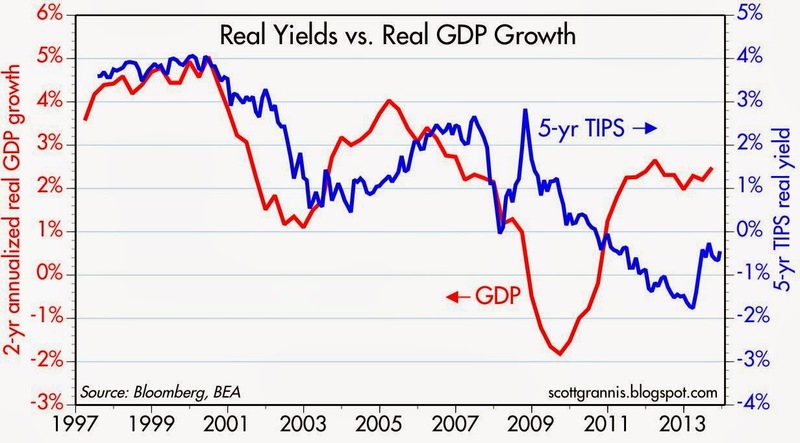 Very strong real growth inevitably leads to strong real investment returns, and TIPS need to compete with that by offering higher real yields. 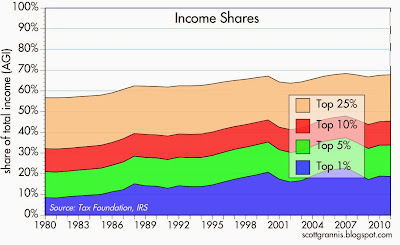 For the most part this has been the case, as the chart above shows. Currently, however, there is a rather large gap between the two, which to me suggests that the market worries that U.S. growth will slip below 2% in the next few years. 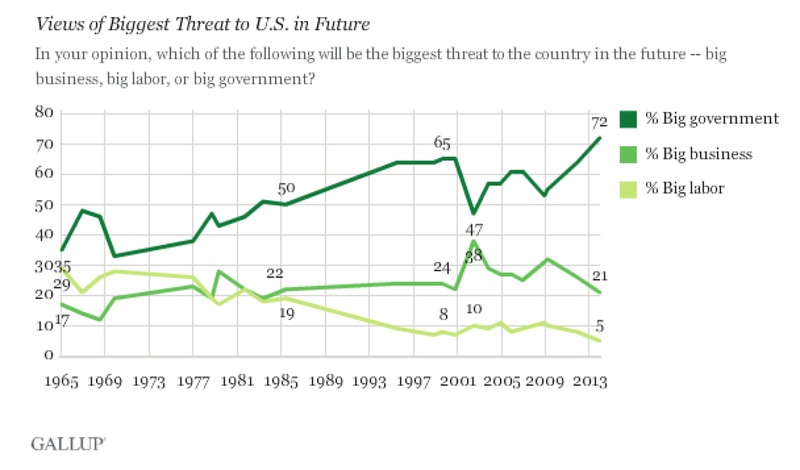 I take this to mean that the market is pessimistic and risk-averse. 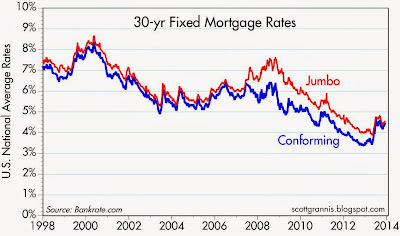 But if real yields continue to rise, that would be a clear sign of a return of optimism and/or a decline of pessimism. 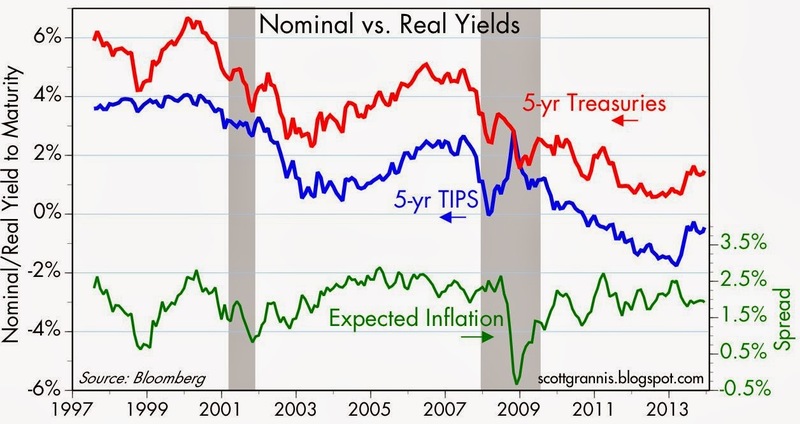 The higher real yields on TIPS go, the more optimistic the market is about the prospects for U.S. growth. 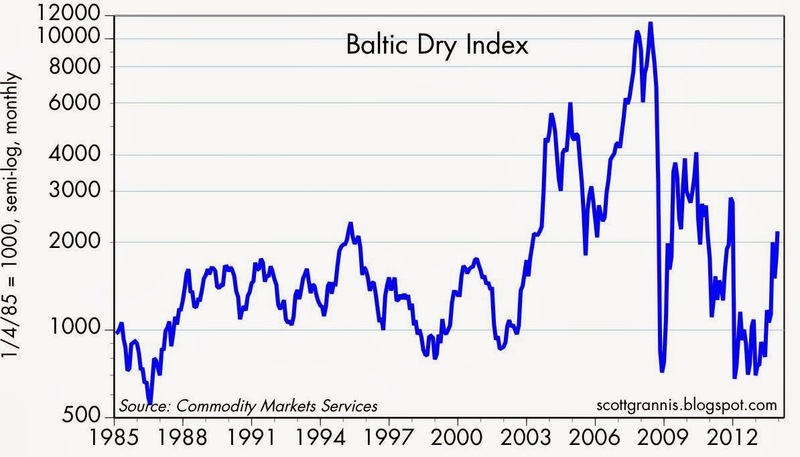 The Baltic Dry Index measures the cost of shipping bulk commodities in the Asia/Pacific region. It is a function of two major variables: the supply of shipping capacity and the demand for shipping capacity. 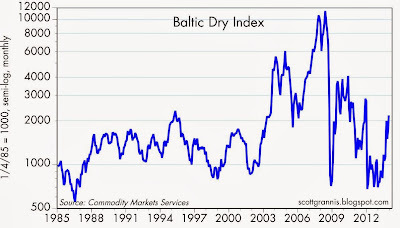 Prices were depressed for most of the past several years because of a significant increase in shipping capacity. More recently they have rebounded rather strongly, presumably because economic activity is continuing to increase (e.g., Chinese demand for coal from Australia) while shipping capacity is relatively constrained. As such, this appears to be signaling a somewhat stronger global economy, which would in turn support a stronger U.S. and Eurozone outlook. The chart above shows that there has been a very strong inverse correlation between the value of the yen and the Japanese stock market. 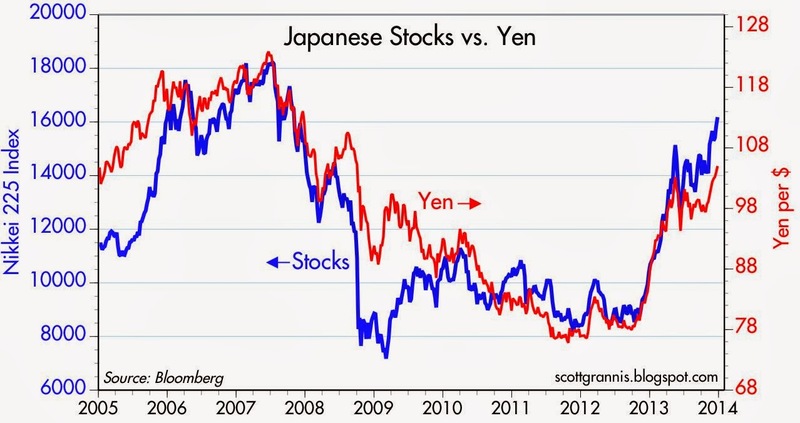 The yen was extremely strong from 2007 through 2011, and the Japanese stock market lost over half its value. That tells me that the yen was so strong (and by inference, Japanese monetary policy was so tight) that it damaged the outlook for real growth by creating deep-seated deflationary expectations and disrupting Japan's ability to compete. Consumers could make money just by holding on to their cash, for example, rather than spending it. Japanese manufacturers faced extreme difficulties competing with overseas rivals due to the incredibly strong yen, which made Japanese goods uncompetitive. The outlook for Japan has brightened considerably in the past year, however, since the Bank of Japan adopted an aggressive policy easing stance. This has allowed the yen to return to non-deflationary levels, and that in turn has allowed Japanese manufacturers to more effectively compete in the global marketplace, and convinced consumers to save less aggressively. If the yen were to strengthen again, that would be a bad sign for the stock market and the global growth outlook. 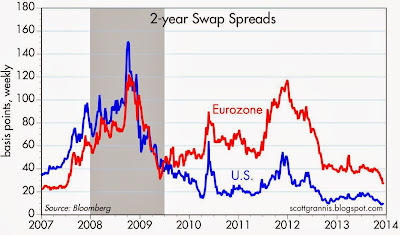 Swap spreads have been very good leading and coincident indicators of the health of financial markets and the economy. U.S. swap spreads have been exceptionally low for the past year or so, a reflection of abundant liquidity and extremely low systemic risks. Eurozone swap spreads have been substantially higher, in contrast, reflecting ongoing problems with sovereign default risk. 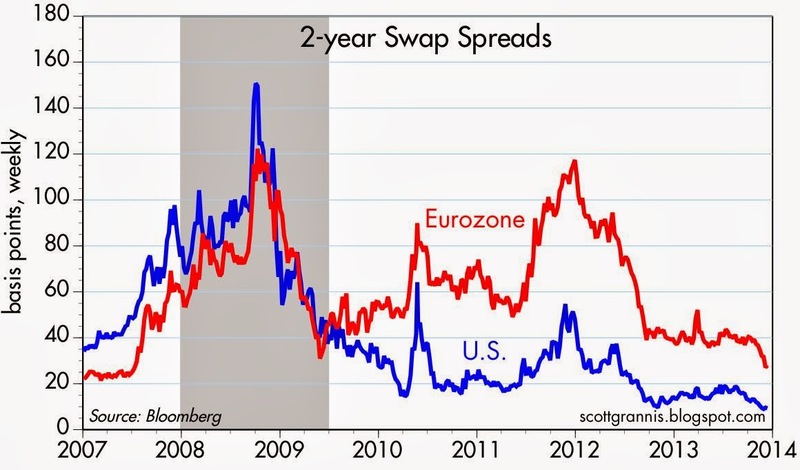 However, the recent decline in Eurozone swap spreads stands out: this is the lowest they've been since pre-recession days. Fundamentals in the Eurozone are likely improving significantly on the margin, and that is good news for just about everyone. 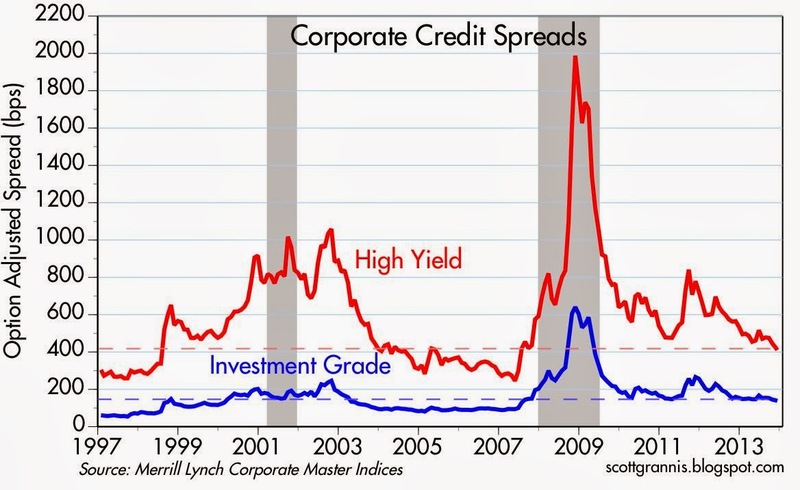 Corporate credit spreads continue to decline, and that suggests that the outlook for the U.S. economy continues to improve. Spreads are still somewhat high relative to pre-recession periods, however, suggesting that the market is still somewhat cautious. The persistence of risk aversion in U.S. markets suggests that risk assets are not yet in a bubble. 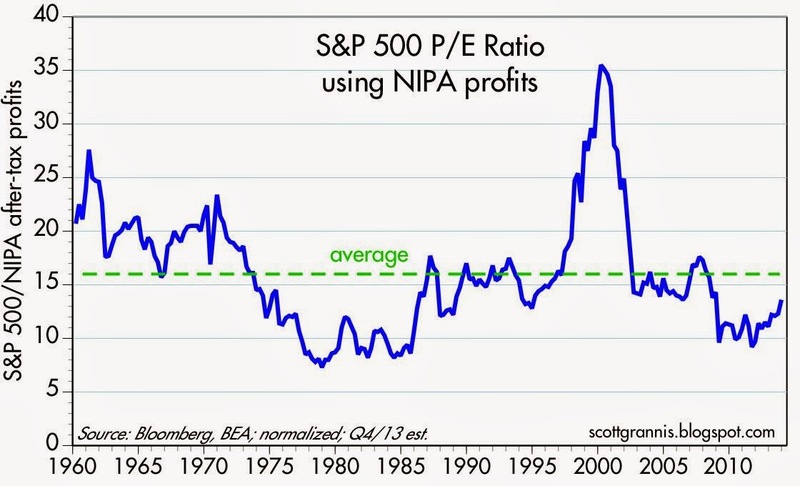 The PE ratio of the S&P 500 is only slightly higher than its long-term average, despite the fact that corporate profits are at all-time highs, both nominally and relative to GDP. 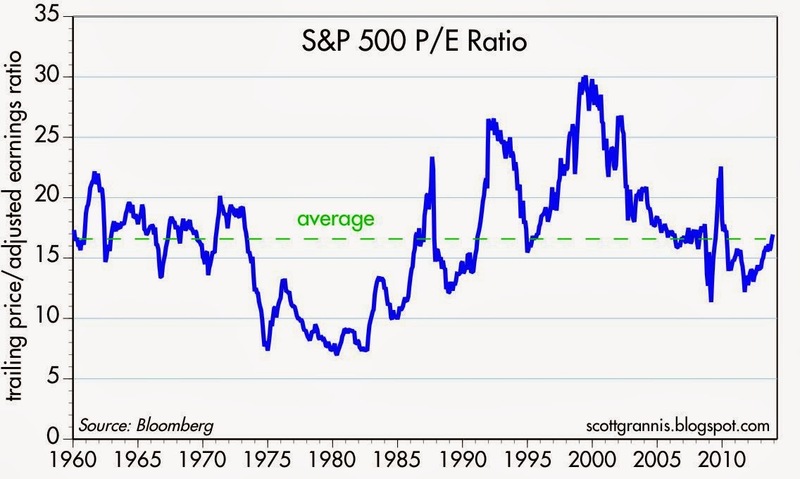 This is another indicator that risk aversion persists and that equity valuations are still somewhat attractive. 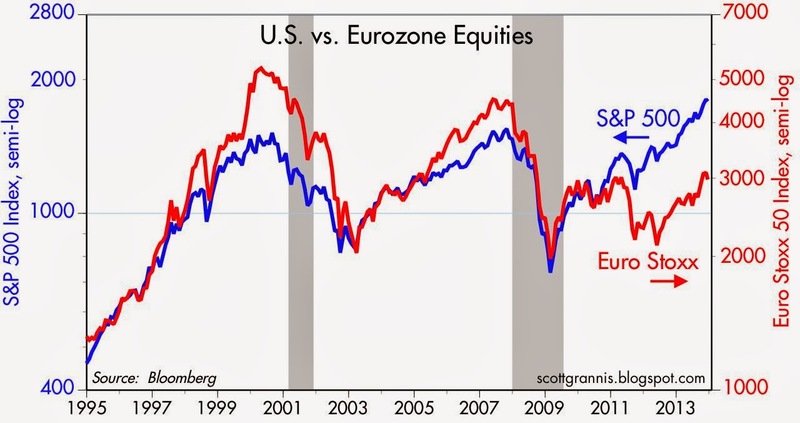 As the chart above shows, Eurozone equities have significantly underperformed their U.S. counterparts in the past few years. The Eurozone economy has been in a recession for most of that period, so this is understandable. The Eurozone economies are now emerging from recession but are still plagued with sluggish growth. Nevertheless, the 12-month trailing PE ratio of the Euro Stoxx index is about the same as the PE ratio of the S&P 500 (both are just under 17), but the forward PE ratio of the Euro Stoxx index is 13, as compared to 15.4 for the S&P 500. This suggests that caution and risk aversion are somewhat more pronounced in the Eurozone, which makes sense given the problems that persist in many of the weaker Eurozone economies. On balance, I don't see that Eurozone stocks are more attractive than U.S. stocks, but there could come a time when the relative valuations of U.S. and Eurozone stocks reveal an attractive investment opportunity.